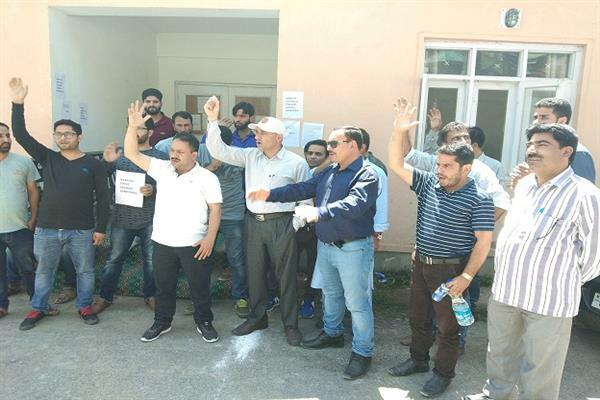 Bandipora, Aug 16 (KNS): Employees working in Government Treasury and Accounts here on today observed one-day strike and staged protest demonstration in the premises of District Treasury Office, here in Bandipora District of North Kashmir demanding redressal of their long pending demands. The protest was organized under the banner of Jammu and Kashmir Accounts Employees Association. According to the KNS correspondent, protesting Employees locked down district treasury office pressing government to accept their demands. Protesting Employees impressed upon authorities to address their demands at an earliest. Employee’s demands include De-linking of KAS from Accounts, Maintenance of 50:50 promotion quota at all levels, cadre reviews of employees, pay parity at par with Central audit and accounts.